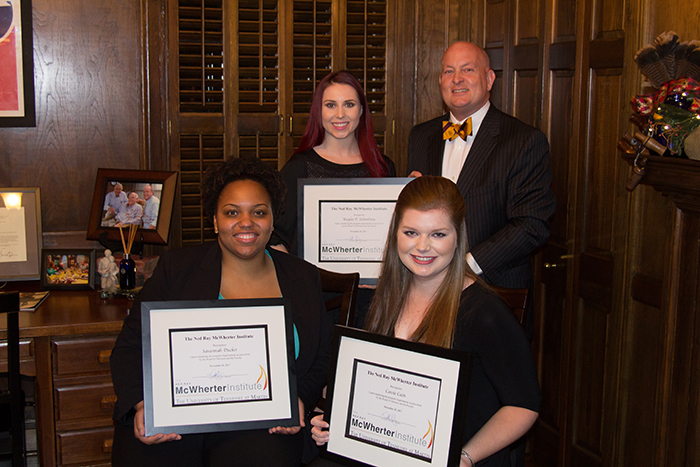 MARTIN, Tenn. – COMPLETE NED RAY MCWHERTER INSTITUTE – Dr. Keith Carver, University of Tennessee at Martin chancellor, recognized students who have successfully completed the university’s Ned Ray McWherter Institute program. The students were honored Nov. 30 during the NRMI’s closing reception at Cary Lawn in Dresden, the home of the late Tennessee Governor Ned Ray McWherter now owned by Bobby and Melinda Goode. Each will graduate Dec. 16 during the university’s fall commencement exercises. Standing next to Carver is Kaylee Schmittou, a health and human performance major from Hohenwald; seated are Savannah Ducker (left) an engineering major from Memphis, and Cassie Cain, an agriculture major and pre-med student from Dowelltown. The three-year NRMI program selects second-year students from different disciplines and helps them connect with mentors both within and outside of the university, increase their awareness of domestic and international culture, and engage in business and public-service activities.